We are proud to announce the Market Maker program which allows all participants to earn money by providing liquidity to a trading market. The market maker program is paid out weekly to all active traders. A market maker is someone who provides liquidity to a market. You can do that by creating sell or buy orders (limit orders), thus reducing the spread. This is good for markets: it gives other potential participants visible options and information. Thick order books also reduce slippage (ie. a large order doesn’t spike the price as much, one way or the other). Thus adding liquidity to a market adds value to all existing and potential participants. 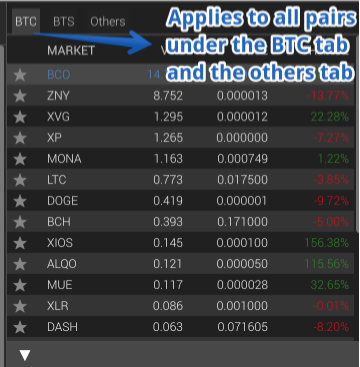 Once a limit order you placed gets filled, you’re not only getting reimbursed for the trading fee, you actually receive 50% of the market taker’s trading fee. At 0.20%fee per trading pair, you are actually earning 0.05%per filled order. (The other 0.15% currently goes to BCO stakers). Our goal is to improve liquidity and spread on all our markets. Payouts are happening on a weekly basis. You place a sell order on CryptoBridge’s orderbook to sell 1 BTC . You are reimbursed your 0.20% trading feeand alsopaid 0.0005 BTC(0.05%)for that filled order. The market maker program applies for all trading pairs that are currently on CryptoBridge and is paid out weekly.